Head to Harbour Town Outlet Shopping Centre and 19 Karen Contemporary Artspacefor plenty of shopping. 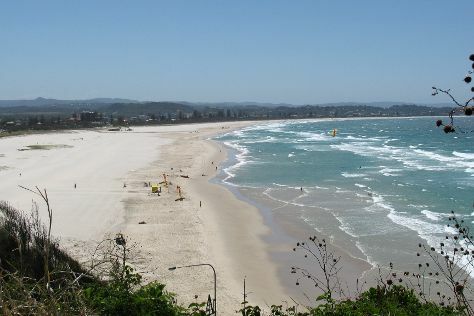 We've included these beaches for you: Burleigh Head National Park and Kurrawa Beach. Step out of Gold Coast with an excursion to Stand-Up Paddleboarding in Byron Bay--about 1h 20 min away. Spend the 30th (Sat) exploring nature at Natural Bridge. There's still lots to do: tour the pleasant surroundings at Kirra Beach, enjoy breathtaking views from SkyPoint Climb, buy something for everyone on your list at Robina Town Shopping Centre, and kick back and relax at Coolangatta Beach. To find where to stay, traveler tips, reviews, and more tourist information, you can read our Gold Coast trip planner . Kuala Lumpur, Malaysia to Gold Coast is an approximately 12-hour flight. You can also do a combination of flight and train. The time zone changes from Malaysia Time (MYT) to Australian Eastern Standard Time (Queensland) (AEST), which is usually a 2 hour difference. Traveling from Kuala Lumpur in November, expect Gold Coast to be slightly colder, temps between 30°C and 20°C. Wrap up your sightseeing on the 2nd (Mon) to allow time to travel to Melbourne. You'll explore the less-touristy side of things at Art Gallery of Ballarat and St. Patrick's Cathedral. Your cultural itinerary includes sights like Degraves Street and Badger's Brook Winery. Venture out of the city with trips to Spas (in Daylesford), Eastern Beach Reserve (in Geelong) and Healesville Sanctuary (in Healesville). There's more to do: learn about wildlife with up-close encounters at Werribee Open Range Zoo. For other places to visit, maps, more things to do, and other tourist information, use the Melbourne online route planner . Traveling by flight from Gold Coast to Melbourne takes 4 hours. Alternatively, you can do a combination of train and flight; or drive. Traveling from Gold Coast in December, you can expect nighttime temperatures to be a bit cooler in Melbourne, with lows of 14°C. Wrap up your sightseeing on the 6th (Fri) to allow time to travel back home.